It is Teacher’s Day in India today and I want to take this opportunity to thank my teacher Promilla Sabharwal. 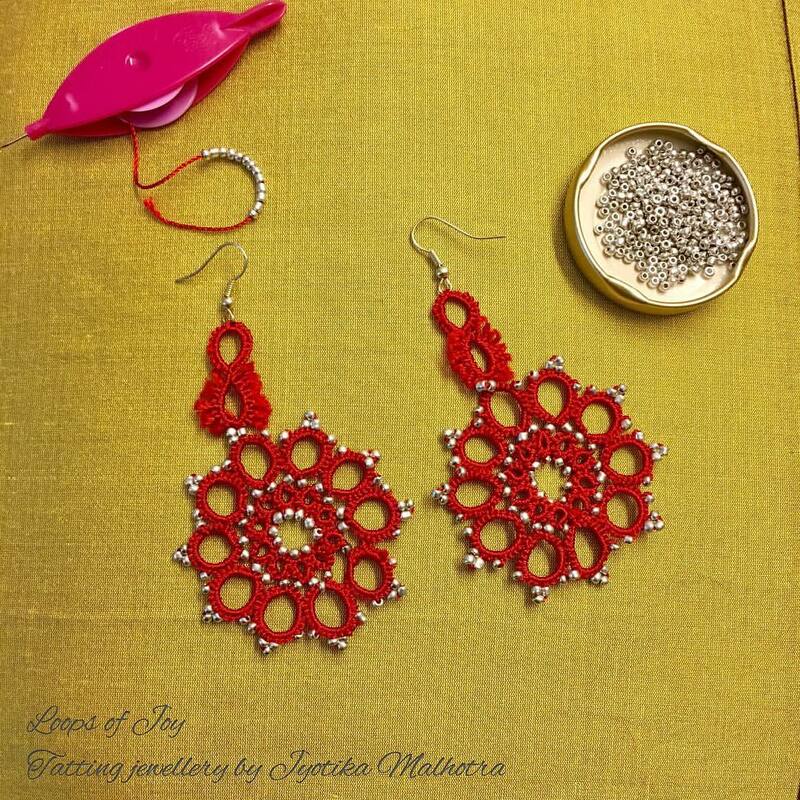 She introduced me to the world of fiber arts 8 years ago through Tatting. I will forever be grateful to her for teaching me this life skill that not only gives me a lot of delight to pursue, but also gives me my sense of individuality. 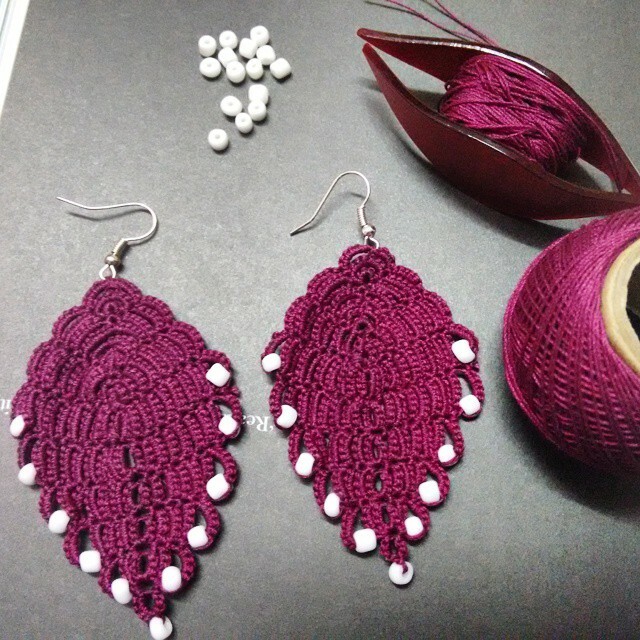 Today, I have the honour of showcasing her unique style in Tatting. With the use of bright colours and stones, her statement jewellery pieces are strikingly beautiful. My interest in fiber arts took a detour this year. 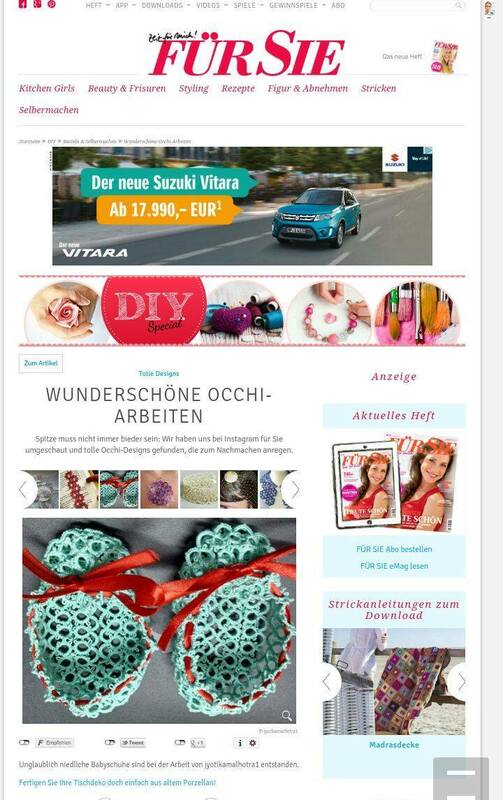 I came back home and took two online Craftsy courses by the wonderful Kim Werker. Those reduced my learning curve phenomenally I feel, and taught me a great deal. 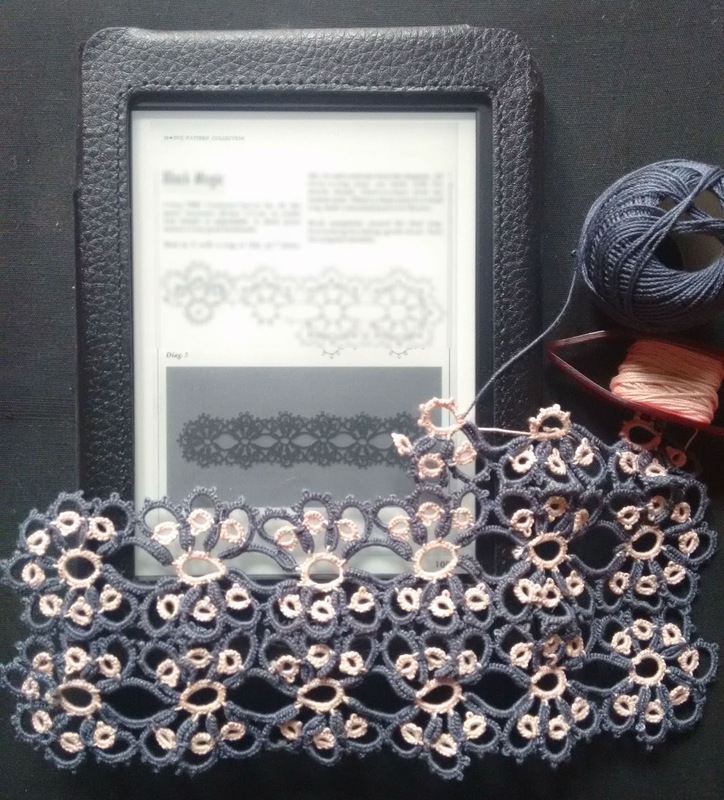 It also made me realize that walking in to a bookstore and buying any crochet book without research is not always a good idea (I bought one with UK instructions, whereas I learned everything in US terms). 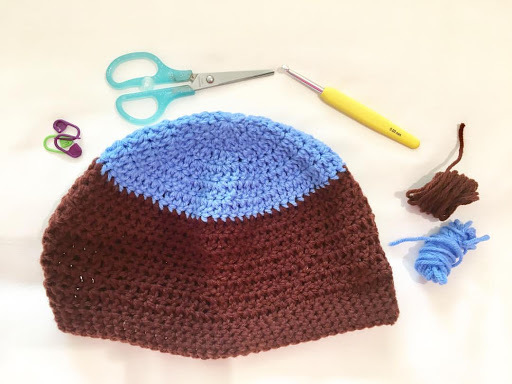 My first project was a simple beanie in two colours. I was aiming to perfect stitches and did not really care about the yarn quality or color scheme. It turned out pretty okay for first attempt. I kept tinkering and learning more forms of crochet stitches.. 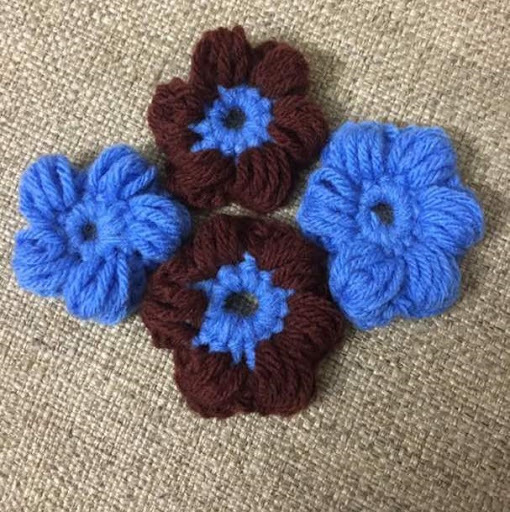 Loved making these puff stitch flowers. I then wanted to transcend from thick yarn to finer threads. I made my first multicolored Magnolia Mandala doily. 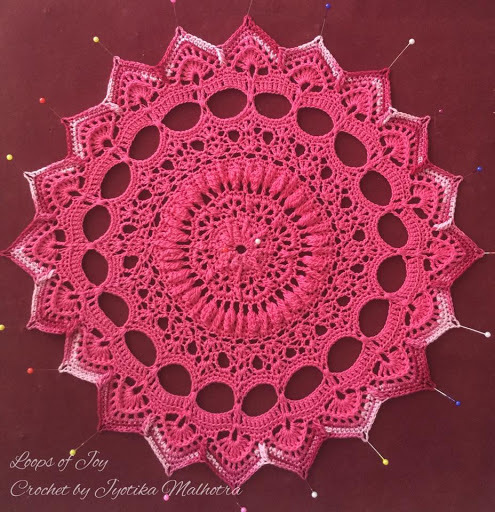 I then took a leap of faith and started the ambitious project of attempting one of Grace Fearon’s Doilies. I selected ‘Tilda’ for this. The journey of these 25 complicated rounds was quite mentally turbulent. 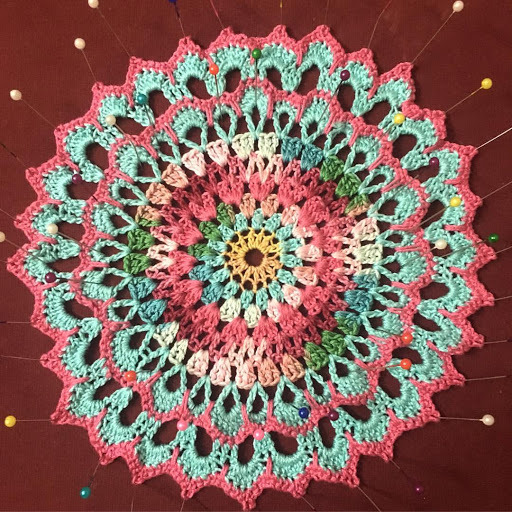 I got stuck on some rounds and had to reach out to fellow crocheters for help. I realised that doilies are not my thing and I would never make one again. Upon completion, once I was done blocking the piece, I was actually quite pleased with the result. Especially, because I ended up learning a lot of new stitches in a single project. 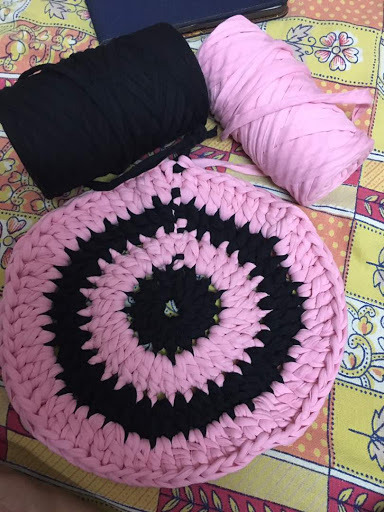 Grace is indeed a crochet scientist to have invented such complicated patterns and have them tested so they turn out exactly how they do on paper. Tilda gave me the confidence and control over finer thread. 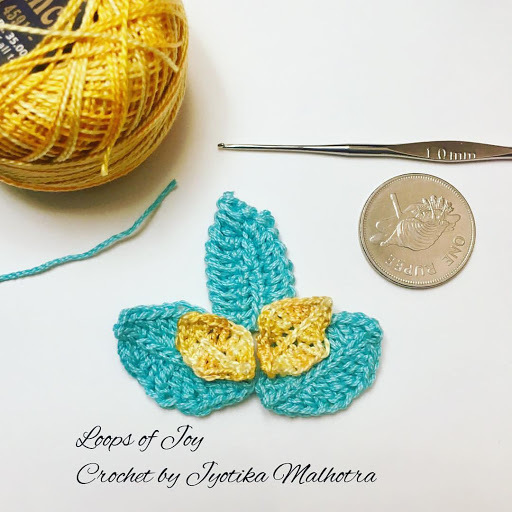 My interest in fiber arts is inclined towards making fine handmade jewellery and that motivated me to try out miniature crochet. 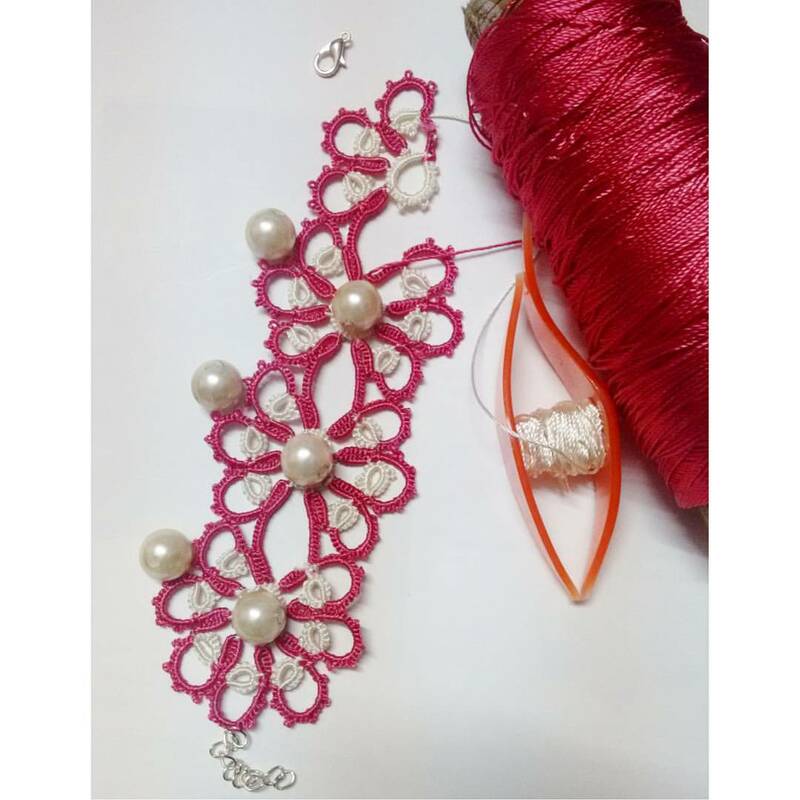 I am combining tatting with crochet and working on a Cro-tat piece of bouquet-tassel earrings. I have also simultaneously begun another ambitious project of crocheting a rug in T shirt yarn. With every round I become quite skeptical with questions about “…how will it turn out? Will it lay flat on the floor? How will I block such a big project?…” Hence, I am taking it easy on this one and making it on my own leisurely pace. Peikko Tatting. Delicate Japanese patterns! I bought the Peikko Tatting book from Etsy about a year ago. I was really tempted at the simple, yet very delicate designs. 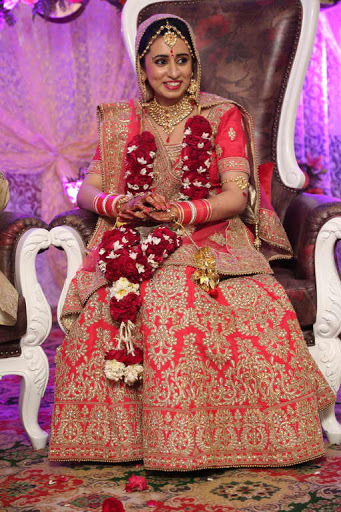 I guess the use of ivory colour made it look very beautiful and dainty. After struggling to decipher Japanese, I am happy to have cracked two patterns in her book. 1. 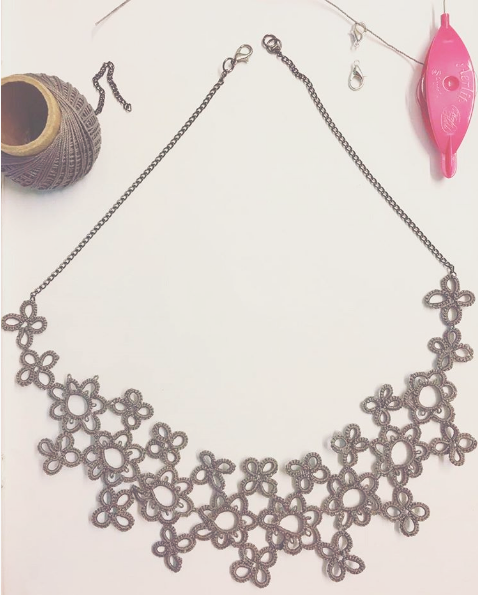 Flower motif necklace: I loved that I learned the technique of single shuttle split ring while making this. Special thanks to +muskaan m for helping me with this. 2. 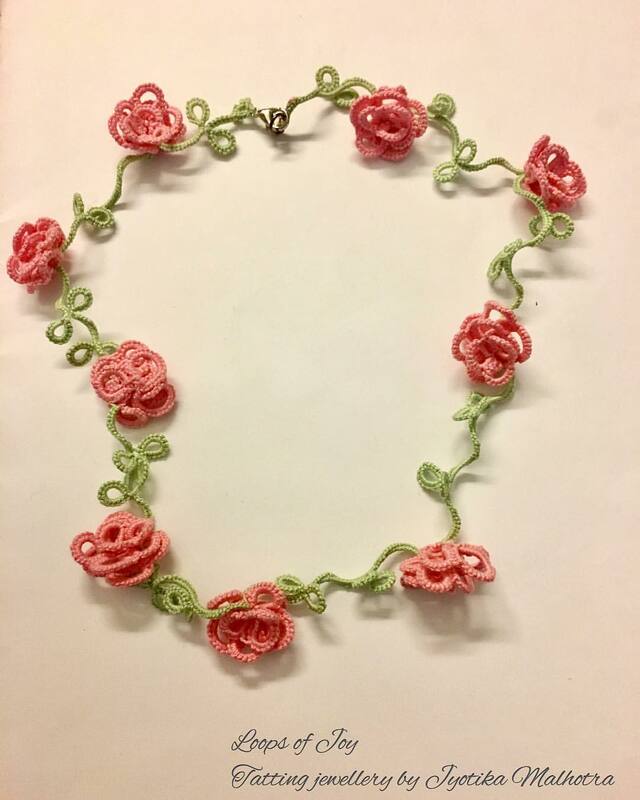 Rose necklace: I was quite content with my first attempt of the 3D roses. I used the technique explained in this YouTube video. 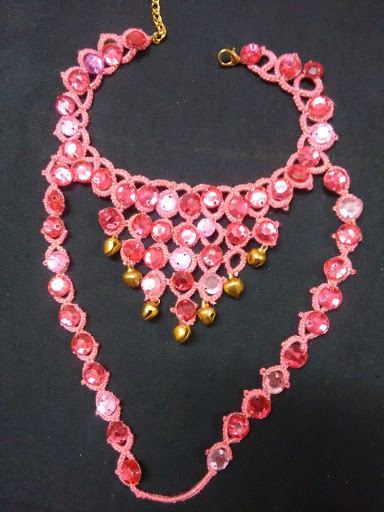 Whenever I have to tat pieces which involve working with seed beads, I have to first gather immense patience and tell myself that this isn’t going to be easy. 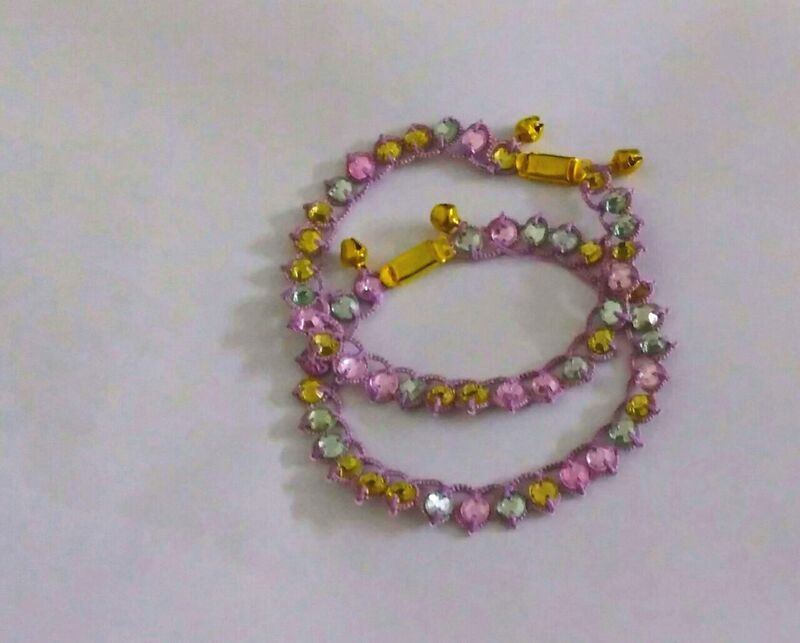 Seed beads are tiny, cumbersome to work with and require extraordinary concentration/ calculation for each ring of the article I am making. 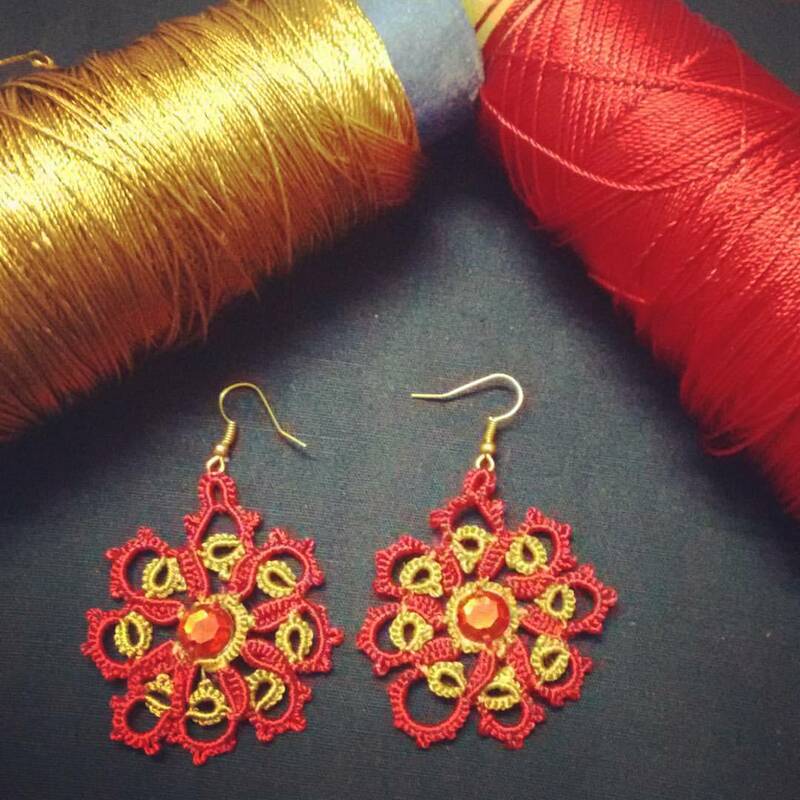 I used Red silk/ polyester thread for the earrings. The pattern is a single shuttle design. 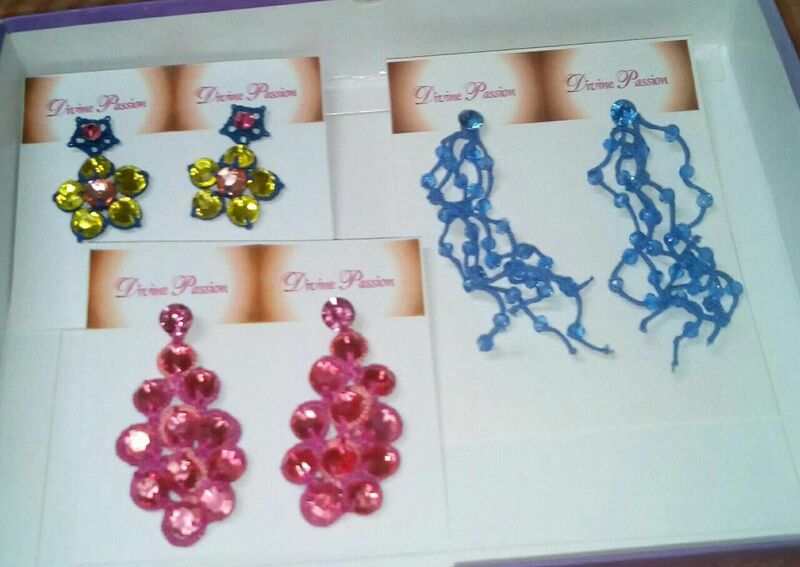 I also used ruffles picots method before finishing off and attaching it to the earring finding. Ruffled picots are basically picots cut and ruffled using a toothbrush or a a similar object. I am back to tatting after a month’s hiatus. I got married last month and was terribly busy in the prep and then the honeymoon. Needless to say that settling up the new house continues to keep me busy even now. 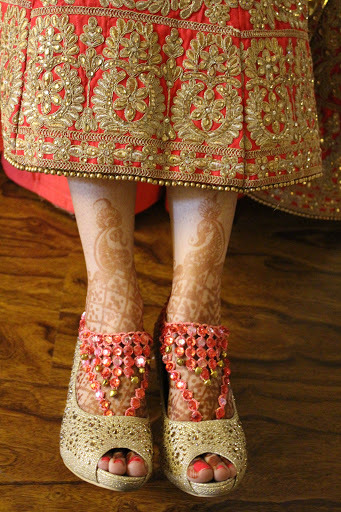 But I wanted to share the Bridal anklets I had been making for my D-day. They turned out very blingy and exactly how I wanted. And it went along with my outfit very well. The design is a series of Split rings and simple rings. 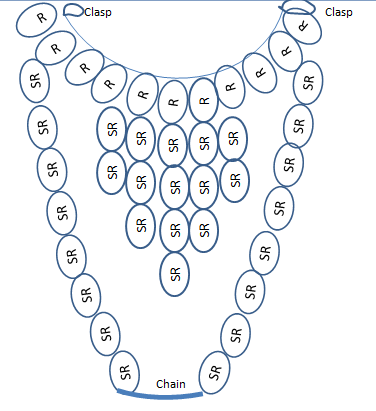 Each ring is R: 5-5-5-5, and Split ring SR: 5-5/5/5. 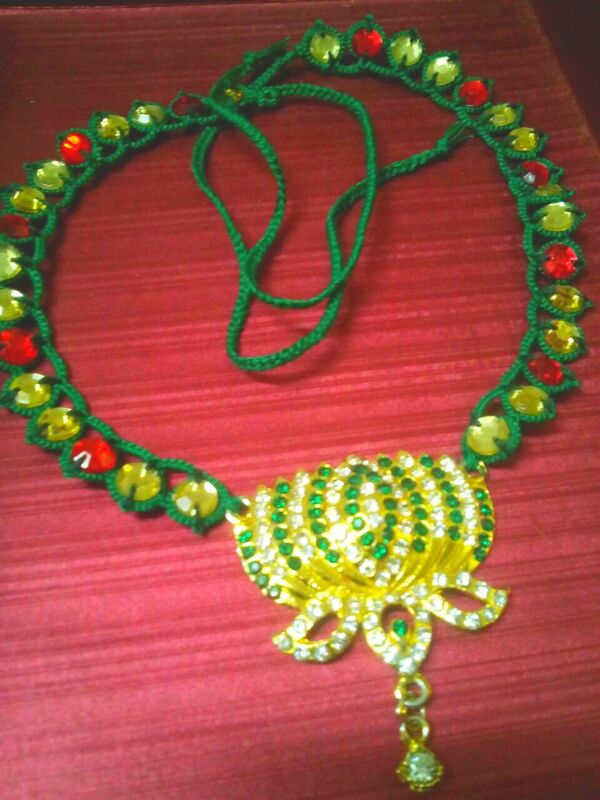 The lengths of the anklet and hence the number of rings can be adjusted as per foot and ankle size. Here is a rough pattern illustration and some pictures of the finished anklet. I really admire tatters who innovate and are able to illustrate their patterns for others to adapt. Sharing three of my favourites that I bought off of Etsy and replicated them. Quite happy with my choice of colours and how they turned out. 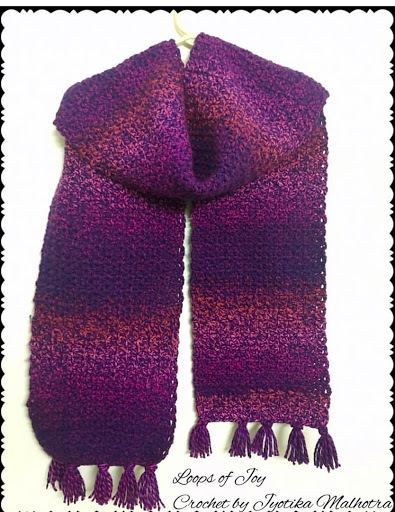 Which is the latest pattern adaptation that you worked on/ are working on? Do share your thoughts in the comment box below. Here’s another blast from the recent past. I discovered Mary Konior’s Black Magic pattern from her book ‘Tatting with Visual Patterns’ some months back. For someone like me who’s not a fan of repeating patterns (and hence seldom takes orders of previously created designs), I replicated this pattern thrice, in different articles each time. Here are the pictures of the Queen’s wrist corset in silk-polyester threads embellished with giant pearls. These were gifted to my soon-to-be mum-in-law. She loved them. 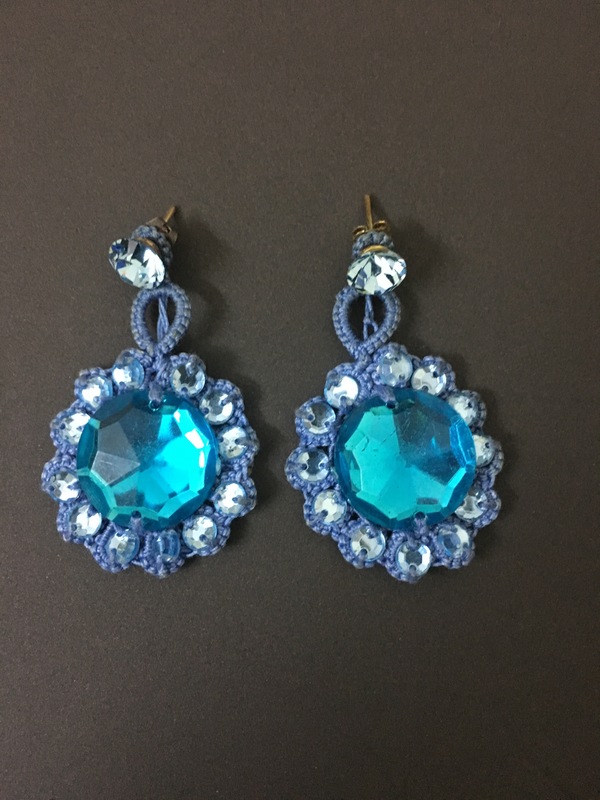 I then made earrings using the same pattern. 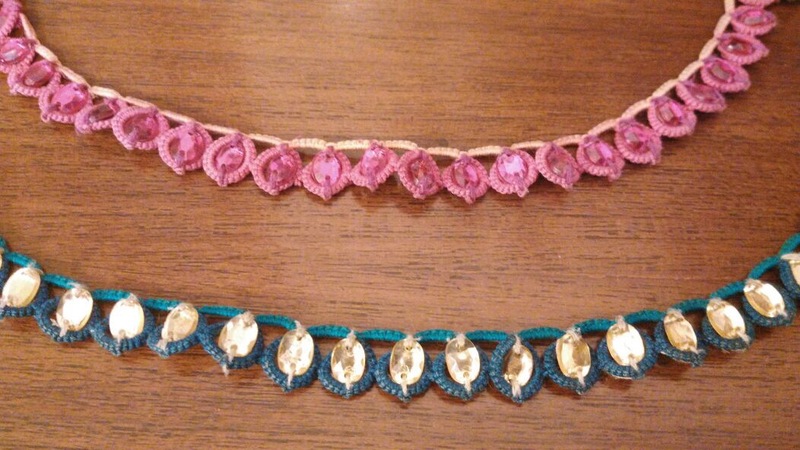 Also plan to make a bracelet in the same design to complete the set some day. I wanted to customize my look and give it my own touch. 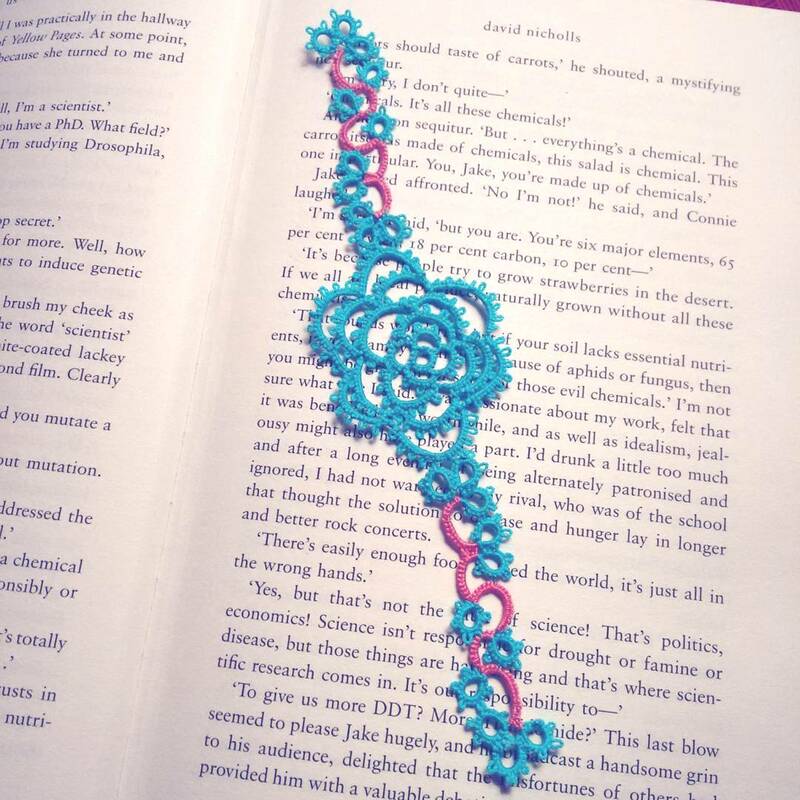 So here’s a peek at the Tatting hair accessories i made, matching the colours of my floral outfit. 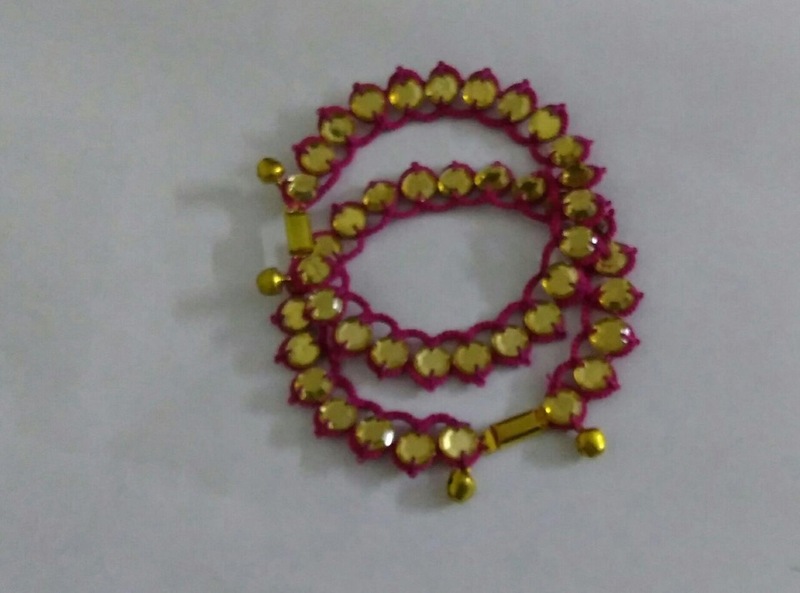 Pattern: Each one is a simple five-ring flower motif, R: 5-5-5-5 with 3 golden seed beads on the second picot of each ring. These were all made with silk-polyester threads, locally sourced. 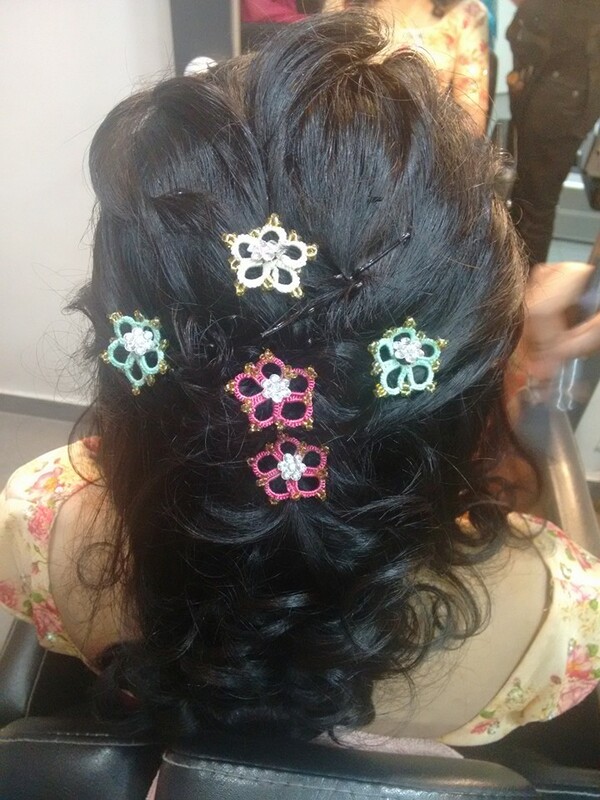 U-shaped pins (ones you use for hair-buns) were inserted through each flower to get a grip in my hair. I also wanted to customize my fiance’s look. So bye bye Pocket squares! 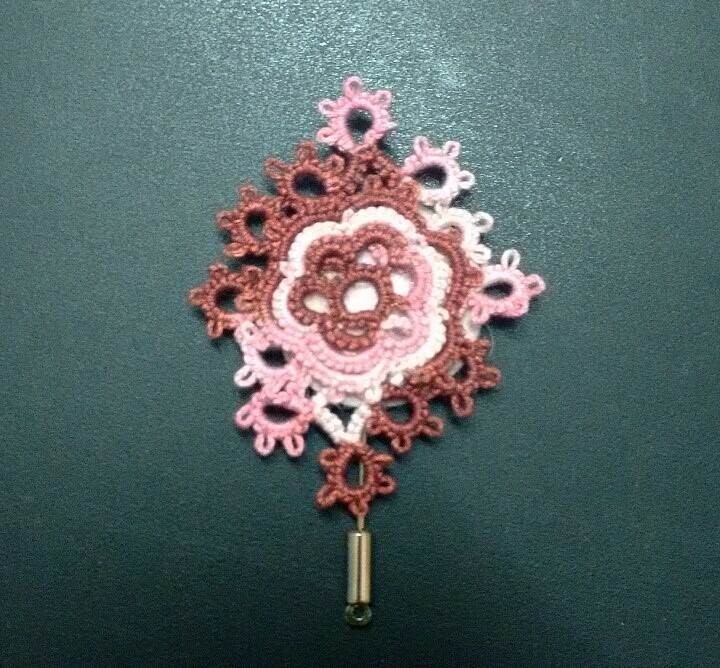 Hello Tatting lapel pins! Again, matching it to my outfit, I chose a two-tone thread. 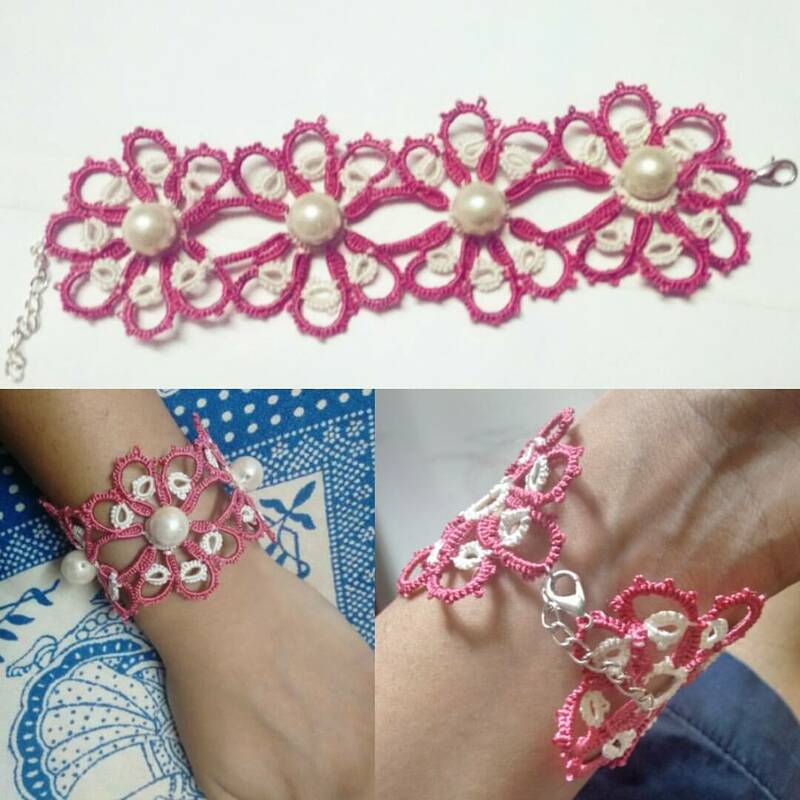 The pattern was courtesy TotusMel’s Lace Corsage Bracelet on Instructables available to everyone for free! I modified the same to turn it into a rhombus shape. This was then glued on to the stainless-steel lapel pin using Fabric glue. 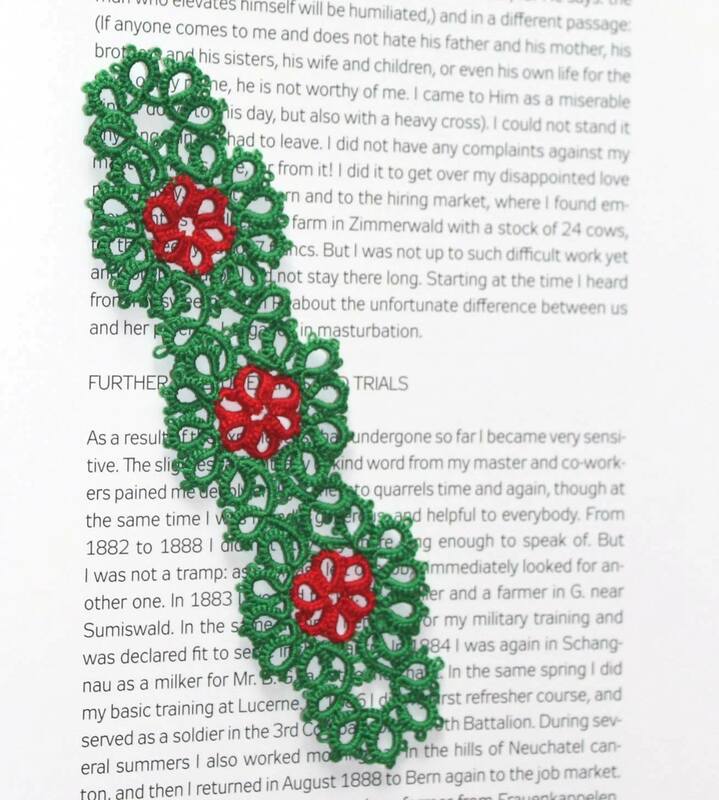 The same can also be used for a brooch. A year back these baby baby booties were made for a dear colleague’s new born. 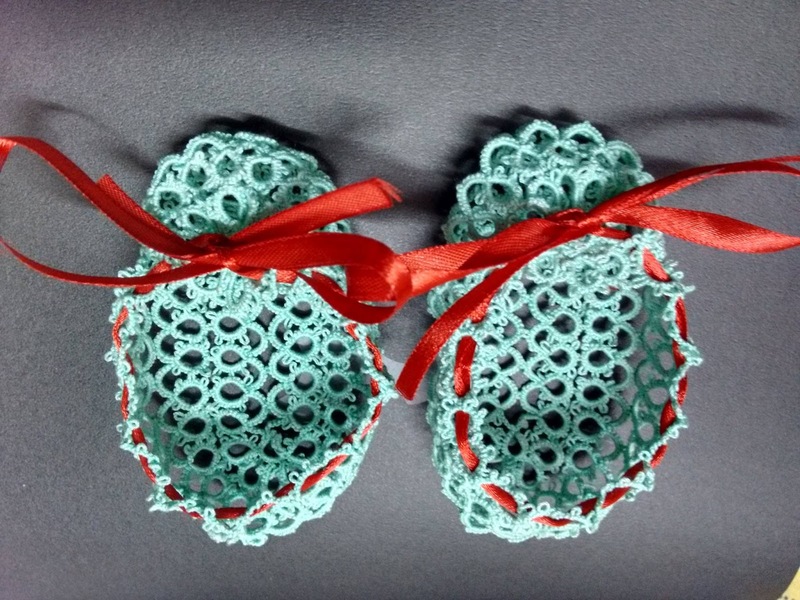 I had adapted and mixed Mary Konior and Karen Cabrera‘s patterns for Baby booties. Since then there has been no turning back. The booties received International recognition twice.